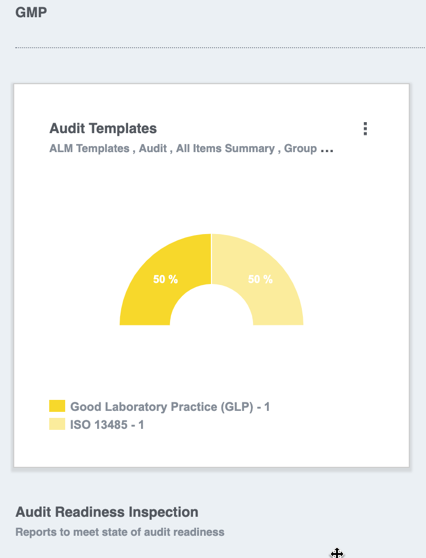 Part of the GMP, a Validation Master Plan (VMP) is a way to clearly define or layout the requirements for process validation and the justification for those validations to better help medical device manufacturers. Organizations seeking control or methodology to a specific process, often make use of a validation master plan. An integral part of a company’s Quality Management System especially if the company specialized in biotechnology, pharmaceutical, and medical device manufacturing, is the validation of their process, product, and facility. The VMP differs from the Standard Operational Procedure (SOP). VMP is used to prioritize objectives, makes plans on the steps to take for a particular procedure while getting the steps ready for approval. On the other hand, the (SOP) showcases the exact procedure to follow to complete approved tasks. Also, the VMP records the total work put into supporting a process, and it includes; apparatus, benefits, activity, prerequisite, and strategy. Although, by FDA Quality System Regulation (21 CFR 820), Validation Master Plan (VMP) does not require a formal prerequisite. However, it is beneficial to have a top quality VMP to execute an efficient procedure validation program. What is Validation Master Plan? A Validation Master Plan is part of the Good Manufacturing Practices (GMP) requirement as it pertains to biotech, medical device companies, and pharmaceuticals. The VMP is a report that chronicles and stipulate methods and equipment that require approval, the reason they are needed and the plan to ensure that a particular process is completed. Also, the person responsible for the validation process is mentioned in the report. Owning a VMP will go a long way in ensuring that you can overcome several difficult scenarios that are sure to come up in very regulated areas. FDA auditors requesting for detailed documentation or procedures, equipment, and validation plan is not uncommon in the industry. While, it isn’t a formal request to have a validation plan, having one prepare will reduce the chances of attracting a warning letter from the FDA. The life cycle of the manufacturing validation process is discussed in the VMP, and it best to integrate the legal paper with the VMP to better improve the overall outcome. Likewise, VMP can be regarded as a project planning tool. The VMP proofs to be beneficial in prioritizing goals, predicting the necessary capital, provide insights and timeline for specific projects. In addition to that, the VMP helps to track effort and document approval status for products, various activities, equipment, benefits, activities, and prerequisite. Finally, the VMP helps to keep an overall agreed upon record for instrument approval system and general procedures. The plan can be easily given to controllers to justify approval impacts. Also, medical device manufacturers can leverage on the VMP to show that they manufacture medical devices with the focus on quality while ensuring that the manufacturer bears the responsibility for the manufacturing system quality. 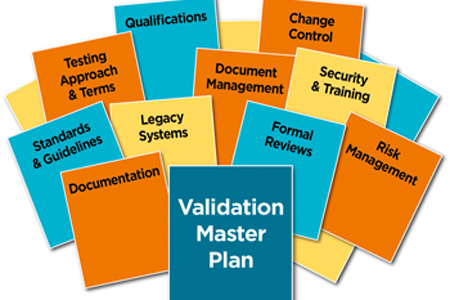 What Makes UP a Validation Master Plan? Ideally, the VMP should consider risk and include the likely effects of the current manufacturing practice on product quality. In so doing, the VMP will be able to pinpoint the procedures that require approval and in what order the validation be executed. Risk assessment does help identify which procedures that do not need approval, using Orcanos RISK management system. Therefore, it is important to survey and examine the effect of each manufacturing process has on the quality of the final product. If justification is needed for any additional prerequisite and extension that may have been added to the validation, then the VMP can be of help. What should be in a Good Validation Master Plan? All likely review and simultaneous validation activity. A report that helps communicate the validation approach to the organization. A detailed account of the timeline, procedures, events, and facilities. Details of departments that have consented to the project. Details on people capable of providing SOPs approval, VMP, conventions, those surveying task, and monitoring tracking systems. There should be details and copies of all approval plans, current SOPs, approval reports, and conventions, pressing strategy records and much more similar information. Table of Contents: Table of contents offers a glimpse into what in the VMP, the critical areas as well as direction to the relevant data. 3 STANDARDS, GUIDELINES & APPLICABLE DOCUMENTS. 15 APPENDIX NO.2 ABUTMENT PRODUCTION FLOW CHART. Authorization and Title Page (dates with approval signatures): The title page will have document number, version, the title, clearly defined management agreement s and QA, these are provided automatically by Orcanos eDMS system for Document Control. Validation Plan: The VMP will help identify why validation is required, what should be validated, where, when and how the validation should be done. The plan will also include a step of procedures broken into the section as well as which methods are vital to the project. Abbreviations and Glossary: Technical terms and organization terminologies will be explained in this section. Approach and Purpose of Validation: The purpose of the VMP clearly states with supporting logical statements the validation approach. The document must be detailed and concise to make for a comfortable and comprehensive read for the end users. The reason for the VMP’s showing of frameworks, procedures, equipment, and structured execution can be explained by the approval approach. However, the proposal does assure that validations will be executed by the approved protocol that is written. With the assurance of reliable method and arrangements of the framework, change of control and capability I bound to exist. Following this approach, all products are sure to follow a well-documented risk evaluation assessment when it comes to their manufacturing procedure and framework. The Scope of Validation: Scope covers utilities, systems, processes, procedures, equipment that might impact the final product during manufacturing as it pertains to VMP. Based on the documented risk evaluation, the scope must capture extensively the frameworks, procedures, utilities, and strategies that will be validated. Likewise, who and what should be stated clearly in the scope. It is vital that from start to finish of the VMP, readers can understand the scope. Outsourced Services: In the VMP, services that relate to the management and selection of qualifications, calibrations, and activities performed by a third party. Roles and Responsibilities: this part of the plan will contain details of the role the VMP department concerning the preparing of validation protocols, change control documents, tasks reports, validation SOPs, maintenance and storage of validation-based documents. 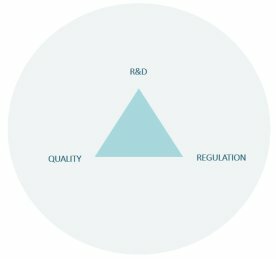 VPM will be kept by during manufacturing and designing through convention deviation, approval convention, tasks reports, and control records while the QA will be approving and reviewing protocol deviations, SOPs for consistency with cGMPs, task reports, validation protocols, approval to implement and consistency with procedures and policies. Deviation management invalidation: Methodology for documenting deviations must be addressed in the VMP. Also, when a deviation occurs during approval, it is to be noted and studied to examine methods or features of the approval convention to determine what corrective action to take and what endorsement for approval should be expected (CAPA), using Orcanos electronics CAPA Management system. Risk management principles in validation: With relations to the validation process, risk management principles should be included in the VMP. The assessment should cover design, deployment and the entire lifecycle of a planned project, using Orcanos RISK management system according to the ISO 14971:2012. Change Control in Validation: A change management (ECO) system must be in place to cater to any changes that may impact the validated process and be documented in the Validation Master Plan, using Orcanos ECO management software. Training: The VMP must define personnel that would be involved in a project, the qualifications they need and training they must undertake to ensure they perform excellently, using Orcanos Training management system. All Validations: This is the totality of the VMP, and it includes an analytical method, cleaning, processes, equipment, premises, computer validation, qualification, utilities, and revalidation, using Orcanos Validation management system. A general overview of the details contained in the VMP includes vital areas such as manufacturing areas, central plant, and material storage. Similarly, connections and illustration should be part of the VMP and differentiate between regions, for instances Non-GMP regions against GMP regions. Other things to be considered or incorporated include; general acknowledgment criteria, major advances in hardware, procedure, frameworks and any other changes that need to be part of the VMP. Validation Matrix: The Validation Matrix is to list all the necessary validation throughout the facility. Using a matrix, timelines to execute crucial approvals will be a reality. References: There must be rundown records of all activities, directions, execution, and capabilities in the VMP, using Orcanos traceability tools. Quality Assurance is top-priority for everyone who is part of the medical industry, hence the need for the Validation Master Plan (VMP). As part of our Orcanos system and services, we handle OQ, IQ, and PQ protocol using the Orcanos testing system. Reports from our system can be generated in any format and data settings. Orcanos eGMP provides full-scale capabilities to allow any organization to conduct it VMP obligations using the Orcanos eFroms system along with its build in process automation infrastructure and increase organization efficiency by 10’s% and reduce risk during the production process. La mayoría de las empresas automotrices gastan mucho dinero adquiriendo infraestructuras internas y hardware de TI para el almacenamiento de datos. Asimismo, gastan dinero en tener estas infraestructuras actualizadas y en mantenerlas. El servicio en la nube ha proporcionado una forma de erradicar esto. Ahora, los datos se pueden cargar en un servidor remoto, y el proveedor de servicios será responsable de la gestión y reparación de los servidores, lo que ayuda a las empresas a reducir el costo inicial de la creación del departamento de TI con recursos humanos y equipos, así como el costo de mantenimiento de la gestión y reparación de los equipos. El servicio en la nube ha permitido que los vehículos inteligentes adviertan a los conductores de una inminente fatalidad o tomen las medidas necesarias para evitar tales situaciones. Por ejemplo, actualmente muchos autos alertan a los conductores de condiciones peligrosas en la carretera, algunos incluso van un paso más allá tomando medidas en favor del conductor, por ejemplo, un freno de auto se activa justo antes de que se produzca una colisión. Estas mejoras han ayudado a reducir el índice de accidentes en la carretera, ya que el conductor no es la única mente “inteligente” en el automóvil. El acceso a la nube ha hecho que conducir un auto sea una actividad divertida. La mayoría cuenta con sistemas de GPS y también se conectan a Internet a través del teléfono del conductor. Ahora se pueden obtener actualizaciones de tráfico en lugar de tener que revisar los teléfonos continuamente mientras se conduce. Además, esto alivia los sistemas de “información y entretenimiento” de los fabricantes de automóviles al utilizar la nube para obtener información sobre el conductor y, por lo tanto, las actualizaciones se adaptan a las necesidades del mismo. Las instalaciones automotrices pueden aumentar su seguridad y minimizar sus riesgos de fallas haciendo algo tan simple como trasladarse a la nube. Los proveedores de servicios en la nube cuentan con personal experto dedicado que trabaja todas las horas del día gestionando y garantizando la seguridad en todo momento; estos expertos también llevan a cabo comprobaciones rutinarias para evitar tiempos de inactividad. Además de esta protección las 24 horas del día, los entornos de la nube también crean copias de seguridad de datos e información, y la empresa automotriz no estará expuesta después de una pérdida accidental de datos. La tarea más importante que realizan los proveedores de servicios es proporcionar un control de seguridad potente (cifrado). Cuando se trata de la industria automotriz, hay muchas piezas móviles, así como datos relacionados con la producción de un vehículo. La industria es compleja y maneja información relacionada con actividades tales como simulacros de ingeniería, procesos empresariales, demanda, análisis de clientes, logística y mucho más. La administración de dicha información puede ser muy tediosa y difícil de comprender. Sin embargo, con la introducción de los servicios en la nube en el sector, los fabricantes pueden aprovechar fácilmente la facilidad que ofrece el entorno de la nube para clasificar los datos de forma rápida y eficiente. Rami tiene más de 24 años de experiencia en varios puestos de desarrollo de software y control de calidad. Utilizando su amplio conocimiento de las operaciones y la calidad, Rami fue uno de los principales arquitectos del software Orcanos en 2005 y más tarde se convirtió en el vicepresidente de ventas y marketing de Orcanos. Rami tiene una maestría en Ciencias de la Computación. Most automotive companies spend lots of money buying in-house infrastructures and IT hardware for data storage. They also spend money keeping these infrastructures up-to-date and also maintaining it. Cloud computing has provided a way to eradicate this. The data can now be uploaded to a remote server, and the service provider will be responsible for managing and repairing the servers, this helps companies push off the initial cost of a setting up the IT department with human resources and equipment and also the maintenance cost of managing and repairing the equipment. Cloud computing has enabled smart or intelligent vehicles that warn drivers of impending doom or take necessary actions to avoid such situations. For example, many cars now alert drivers of dangerous road conditions, some even go a step further by taking action for the driver, e.g. a car brake going off just before a collision occurs. These improvements have helped to reduce the rate of accidents on the road as the driver is not the only “intelligent” mind in the car. Access to the cloud has made driving a car a fun activity. Most cars have GPS systems and also connect to the internet via the driver’s phone. One can now get traffic updates as opposed to checking their phones all the time while driving. Also, this relieves the automakers “infotainment” systems by using the cloud to get information about the driver and so updates to suit the driver’s needs. Automotive facilities can boost their security and minimize their risk of failures by doing something as simple as switching to the cloud. The cloud service providers have dedicated expert staffs that work all hours of every day managing and ensuring security at every point in time; these experts also carry out routine checks to avoid downtimes. In addition to this round the clock protection, cloud environments also create data and information backups, and the automotive company won’t be in the rain after an accidental loss of data. The most important task done by the service providers is delivering powerful security control (encryption). When it comes to the automotive industry, there is a lot of moving parts as well as data involved with producing a vehicle. The industry is complex and handling information relating to activities such as engineering simulations, business processes, demand, customer analysis, logistics and many more. Managing such information could be very tedious and hard to comprehend. However, the introduction of Cloud Computing to the industry, manufacturers can easily leverage the ease that the cloud environment provides to sort through data quickly and efficiently. If you are a new startup or matured supplier that address solution of OEM to the Automotive Industry you probably already know the requirements coming from the supply quality auditor of your prospect regarding the ASPICE. This is the time to think it over and look at what the cloud solution is offering today to vendors like you. 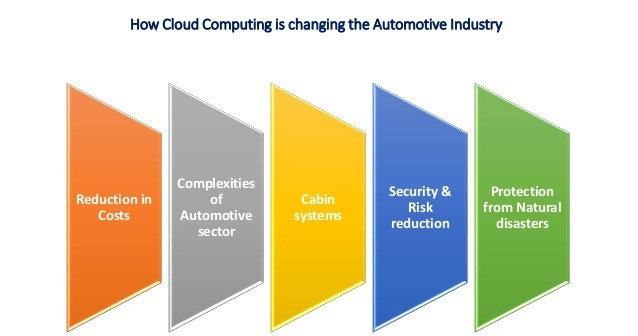 We gave in this slide deck a quick glance on how the cloud world can extend the possibilities for vendors that are outside of the traditional automaker community. We have built state of the art system Orcanos that already serves many companies helping them daily to achieve their compliance goal, and more than that, to maintain the organizational culture needed to keep winning the trust of the market. Orcanos 4.0 new release now includes a complete training program plan to support the GMP process. The Orcanos new release involves a set of optional training tasks with a list of topics and agenda to be covered in order to be in compliance with the GMP. These training topics are covering Medical Device and Pharma producers including Cannabis growers who need to comply with the enforcement of the strict regulations by the legislation of the local government. Orcanos as a world leader in the eGRC and eQMS and ALM market happy to get you the list of topics in a specific each subject area according to your professional demands, please simply click www.orcanos.com to get your FREE edition. Automation and Standardization: With Orcanos eGMP software, you can standardize all documents-based processes and automate distribution/routing, review, follow-up, escalation, and approval of documents. It makes search and retrieval of documents faster and easier. Centralized Platform: Orcanos can serve as a centralized platform for all quality documents and records critical to eGMP compliance, making it essentially your eGMP system. Orcanos is web-based so authorized users have access to the system from virtually anywhere 24/7 not holding your production line and allow granting confirmation service without the local presence or human resources. Connectivity: Orcanos is unlike other eGMP software solutions in the sense that it can connect all quality processes, including document control, training control, audit management, nonconformance management, CAPA, MRB, DHR and change control. This connectivity will help ensure that quality and other issues will not fall through the cracks. Mobile Access: With Orcanos adoptive technology, users can access the system using a tablet or a smartphone. This capability is a distinct advantage of Orcanos over other eGMP software solutions and it can be very helpful for users out in the field or those constantly traveling. Those users will be able to participate in documents-based processes critical to eGMP compliance even when they are not in their local office. Validated System – Orcanos is a validated system that no customization requires any effort invalidation. It is fully CFR 21 Part compliance system and already servers many customers around the world. Orcanos has released the ASPICE v3.0 best practice that supports the System Engineering Process Group (SYS). 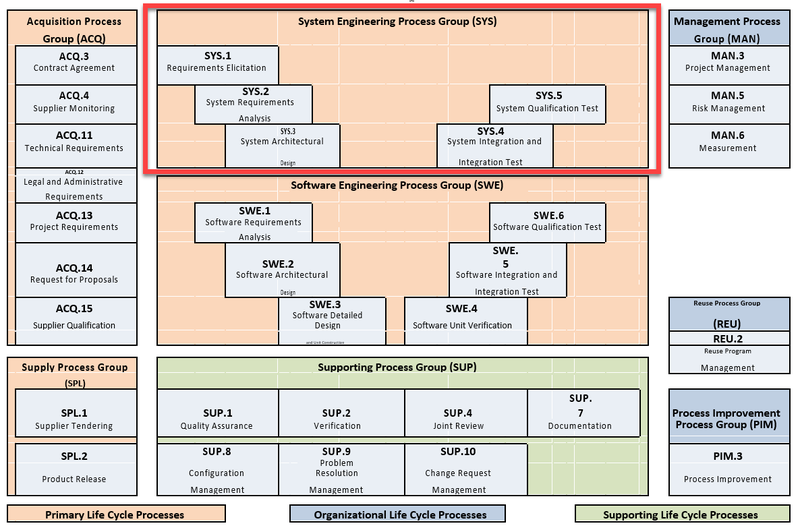 The System Engineering Process Group (SYS) consists of processes addressing the elicitation and management of both customer requirements and internal requirements, the definition of the system architecture, and the integration and testing on a system level. Orcanos’s innovative system acts as compliance engine that roles the entire process described by the ASPICE Process Reference Model. It creates new opportunities for all ISV suppliers who wish to penetrate the market of giants. Our recent exposure to small players in the automotive domain, that cooperate with giants such as BMW, VW, and Mercedes-Benz, presented the complexity those vendors are facing in order to comply with the ASPICE requirements. Orcanos is about to launch its QMS-Regulation-Compliance engine as part of Orcanos integrated ALM and Quality Management Software System. Compliance best practices lie at the heart of all standards-based regulations and good quality management, such as ISO 14971, IEC 62304 and ISO 13485. However, it is a challenge to keep compliance without electronic QMS, or using traditional ALM tools, as most of them are R&D driven, and lack the support of the quality management software system. Compliance remains a leading concern for regulated industries such as Medical Device, Pharma and automotive. The powerful new capabilities of Orcanos Compliance Engine would simplify the way companies govern and control quality and regulations, and will provide a “Virtual Auditor” that would scan the project data in respect for specific industry regulation, and quality best practice, such as compliance with ISO 14971, IEC 62304 and ISO 13485 and more. Orcanos QMS Compliance Engine is a flexible tool that allows companies define any regulation in a simple Excel or Google Sheet, defining the standard, section, classification in case of medical device (CLASS I, II, III), Remediation, and many other parameters, ans then import these regulations into Orcanos ALM and QMS platform and connect it to their projects records. This is an example of an “Virtual Auditor” that inspects the compliance of specific product with the ISO 14971.